Kangaroo Island Lamb: chimichurri lamb skewers with natural sheeps yoghurt. 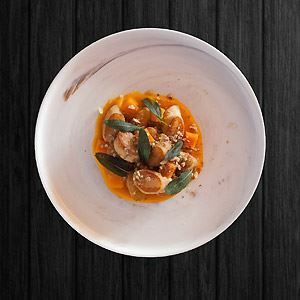 With glimpses of Stokes Bay in the distance, Table 88 on Deep Gully Track brings Mediterranean-inspired tapas to Kangaroo Island. 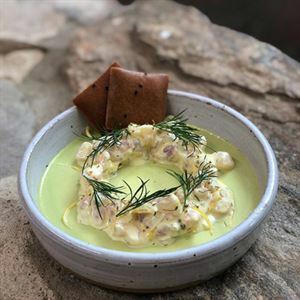 Located in a rural setting on the north coast, this recently opened restaurant has a relaxed ambiance and welcoming vibe, where guests can linger on the deck at wooden barrel tables with a glass of wine in hand. Choose from a share plate menu highlighting local KI produce, with tastebud temptations such as grilled marron with garlic butter, or perhaps mushroom arancini risotto balls with herbed mayonnaise. Salivate over succulent morsels like pork and veal meatballs in a rich tomato sauce, pan fried KI halloumi topped by spiced onion relish, or local lamb chorizo and saucy salsa. For a sweet treat, try the Portuguese custard tart. 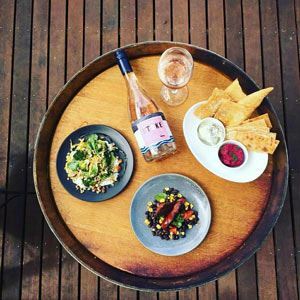 Located on the North Coast of Kangaroo Island just 1km from Stokes Bay beach is Table 88, Mediterranean inspired Tapas Bar and Restaurant, serving food and drinks to be shared from 11am-10pm. Opening days vary, follow us for updates, specials and events. Contact us today with your enquiry 08 8559 2164.